Explore Tongariro National Parks famous Tongariro Crossing day hike, considered one of the finest day walks in the world. 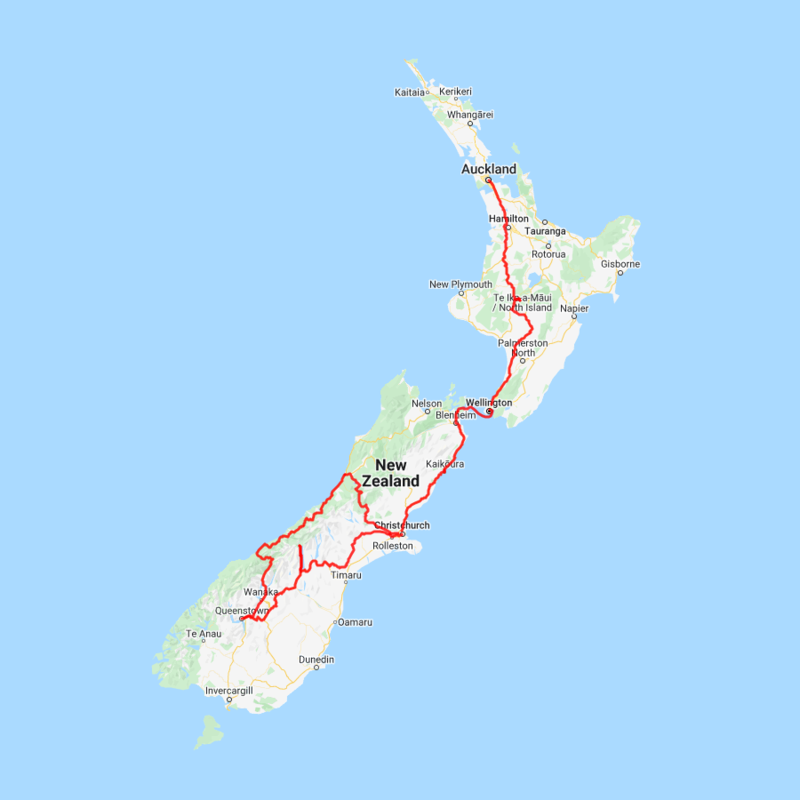 Then travel south and cross the Cook Strait and drive the Pacific coastline to Kaikoura and onto Christchurch. From there you'll head to Mt Cook National Park before venturing deeper south and into the Southern Lakes region. From here you take the 3 day/2 night guided walk on the famous Routeburn Track. Returning to Queenstown you then continue north to the glacier region before returning to Christchurch on board the Tranz Alpine Scenic Train. You can expect to spend around NZ$303 in fuel cost on this itinerary based on an intermediate sized car. Today you will leave Auckland and travel south through the rolling pastures of Waikato. Take the time to detour to Waitomo and experience its network of underground caves before heading inland to the Central Plateau and arriving at Tongariro National Park. A world heritage site, Tongariro is home to three active volcanoes Ruapehu, Tongariro and Ngauruhoe as well as a host of activities including hiking, fishing, climbing, mountain biking and skiing. Your drive today takes you from the North Island Volcanic Plateau to New Zealand's capital, Wellington. Leaving Whakapapa Village, make your way through the Rangipo Desert, skirting the edges of the Tongariro National Park, one of New Zealand’s three world heritage sites. Catch a glimpse of the volcanically active Mt Ruapehu and if you're Lord of the Rings fan, you'll enjoy seeing the symmetrical Mt. Ngauruhoe - better known as Mt Doom. A little further is the military town of Waiouru, home to the New Zealand Army museum and a unique collection of military history. Continue south to the rural towns of Taihape, Mangaweka and Bulls before arriving on the spectacular Kapiti Coast. Take a short detour to the quaint seaside town of Paraparaumu before arriving into Wellington City. Nomad Safaris offers a complete 4WD tour into the historic Skippers Canyon. The Nomad Safaris Skippers Canyon adventure is a half-day heritage tour that follows the rugged and once treacherous Skippers Road. Travel the road that was hacked by hand into the sheer cliff sides of the Shotover River Valley making this an exciting adventure the whole family will enjoy. As your guide navigates this awe-inspiring canyon you will visit many historic sites such as the Skippers Suspension Bridge and the township of Skippers. Visit the restored school house where you will gain a real insight into the local heritage through photos and histories of life in this tough environment. British Automobile Association voted Skippers Canyon Road as one of the 25 most scenic roads in the world. This evening leave your rental car keys with the reception at your accommodation. Make sure you take any items such as Kruse, GPS etc with you and that car fuel tank is full. The next morning Europcar staff will collect the rental car from your accommodation. Today there is a pre-walk briefing for Routeburn Track walkers at 3:45pm at the Ultimate Hikes Centre in Queenstown, it is compulsory to attend. The briefing will cover everything you need to know to prepare for your hiking adventure. The Routeburn Track traverses wild and scenic mountain country between the Hollyford and Dart Valleys at the base of New Zealand's Southern Alps. Since the 1880's the Routeburn Track has proved to be one of the most accessible and popular journeys into New Zealand's forests and mountains. The Routeburn Track passes through two national parks, Fiordland and Mount Aspiring, and is part of Te Wahipounamu, South West New Zealand World Heritage Area.The area is a haven for native birdlife: the Robin; Fantail; Parakeet; Bellbird; Yellowhead and watch out for the resident Kea at Routeburn Falls! The variety of landscapes will astound you: mountainous peaks; sheer rock faces; alpine basins; pristine lakes; cascading waterfalls; luxuriant forest; turquoise rivers and million dollar views around every corner. The Routeburn Track Guided Walk is a 3 day / 2 night Queenstown to Queenstown all-inclusive guided walk traversing New Zealand's Southern Alps. The package includes all transport, accommodation, meals, snacks, backpacks and rain jackets.Accommodation is inluxury lodges and you will be led by expert Ultimate Hikes guides. Your adventure begins with a coach ride from Queenstown to the Divide on the scenic Milford Road. Begin your hike up a well-graded trail until you get above bush line, then take a side trip up to Key Summit. Descend to Lake Howden for lunch, before continuing steadily upwards to the magnificent Earland Falls. Further along the trail, the snow-capped peaks and glaciers of the Darran Range come into view before you make your descent to Lake Mackenzie Lodge. (Includes lunch and dinner). The trail descends from the Routeburn Falls to the alpine meadows of the Routeburn Flats. Pass crystal clear river pools and enter the forested gorge, opening to the lowlands. Coach back to Glenorchy for your group photo and then on to Queenstown, arriving at 4.00pm.